London – Feb. 28th, 2019: The UAE Minister of Energy & Industry, H.E. Suhail Al Mazrouei, was presented with the ‘International Oil Diplomacy Person of the Year 2018’ Award in London today at the Energy Institute’sInternational Petroleum (IP) Week. This prestigious accolade was awarded last year to H.E. Khali Al-Falih, Saudi Arabia’s Minister of Energy, Industry and Minerals. The Energy Institute is the largest Royal Charter international professional membership organisation and learned society concerned solely with energy, with Her Majesty the Queen as its Patron. IP Week is recognised as one of the major international oil and gas events, where senior leaders, policymakers and academics gather to share, learn and shape the future direction of the industry. IP Week has an international appeal, attracting delegates from over 50 countries and it is one of the major events in the global oil and gas industry’s calendar. “As President of the OPEC Conference, you have shown exemplary vision and leadership through 2018 with your stewardship of the continued implementation of the "historical" agreement to seek oil market stability among some 25 OPEC and non-OPEC countries to the benefit of producing and consuming nations alike,” said Louise Kingham OBE FEI, Chief Executive Officer, Energy Institute. As Minister of Energy and Industry for the United Arab Emirates His Excellency has taken a global leadership position among hydrocarbon-rich nations in steering the Middle East away from fuel subsidies, and tackling unsustainable consumption patterns to ensure the UAE and others are aligned with the international community’s efforts in overcoming the challenges of climate change in support of the Paris Agreement, the Energy Institute stated in its Letter of Award. His Excellency, who has been the UAE Minister of Energy & Industry since 2013, said he was “humbled and honoured” to receive the accolade. Under the auspices of the Energy Institute���s International Petroleum Week HE Suhail al-Mazrouei was nominated by Gulf Intelligence, the EI’s Middle East knowledge partner, and supported by the Energy Institute Council, as this year’s Winner of The International Oil Diplomacy Person of the Year Award 2018. “The efforts by the UAE Minister of Energy in his role as OPEC President contributed significantly to oil prices recovering through the year to average above $70 a barrel in 2018, after hovering around $55 in 2017,” said Sean Evers, Managing Partner, Gulf Intelligence. “His diplomatic skills were critical in a year when the fabric of the OPEC+ 25 countries could have frayed and fallen apart,” he said. In December 2018, OPEC and non-OPEC producers agreed to reduce oil output jointly by 1.2 million barrels a day through to June 2019. This followed two years of cuts of 1.8 million b/d, which witnessed average compliance rates of 100% across the group in an historical demonstration of cooperation among producers to tackle a global glut in oil inventories and collapsing prices. H.E. Eng. 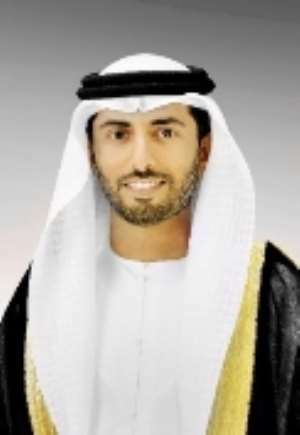 Suhail Mohamed Faraj Al Mazrouei was appointed as the UAE Minister of Energy on 12 March 2013, where the Ministry's main tasks focus on contributing to sustainable development, coordination and representation of the petroleum, minerals, electricity and water affairs; and making a good use of them all for the benefit of the national economy. Moreover, H.E has been appointed in 2017 as The UAE Minister of Energy and Industry. H.E. graduated in 1996 from the University of Tulsa in the United States with a Bachelor’s Degree in Petroleum Engineering. He was born in Dubai on July 1, 1973. His hobbies include poetry, literature and history. He is married and has four children. Gulf Intelligence is a strategic communications & research firm effective across the full value-chain of the Middle East Energy Sector. We facilitate knowledge exchange and advance the business interests of national and international stakeholders operational in the regional industry.